The Glenohumeral Joint (Shoulder Joint) is a potentially unstable joint due the head of the humerus (ball) having a wider circumference than the socket (glenoid) which is comparatively shallow. The stability of the Shoulder is therefore dependent on the adjoining soft tissues like the labrum, capsule and the ligaments. Recurrent dislocation means having repeated dislocations of the Glenohumeral complex of the Shoulder Joint. During this dislocation the humeral head pops out of the glenoid cavity due to instability. This type of Shoulder Instability may be either caused by a traumatic dislocation (after a fall or injury to the Shoulder), due a generalized laxity of ligaments, or due to gradual stretching of the joint capsule due to a repetitive injury which is seen in a throwing athlete like a pitcher or bowler. What is a Bankart Lesion and a Hill Sachs Lesion? Bankart Lesion is an MRI Finding. It results from detachment of the anterior inferior labrum from the underlying glenoid, and is usually as a result of previous Anterior Shoulder Dislocation. The detachment may be labral (Soft Tissue) only, or may involve the bony margin of the glenoid (impaction fracture) called the Bony Bankart. Additionally, labral tears may also be present. Hill Sachs Lesion is also a radiological finding. It is a cortical depression in the posterolateral head of the (Ball) humerus bone. It results from forceful impaction of the humeral head against the anteroinferior glenoid rim when the Shoulder is dislocated anteriorly. In a proportion of patients the Bankart’s Lesion does not heal completely causing the joint to be unstable and vulnerable to further dislocation with lesser injury (trivial trauma) trivial or no injury. It is now well known has been shown that the younger the patient at the time of first dislocation (age less than 25 years), higher is the chance of a re-dislocation. The chance of Shoulder Re-dislocating after the first dislocation can be as high as 70-90% in a young patient (below 25 yrs of age). With each dislocation the capsule in the front gets stretched and thinned out making further dislocations to happen occur with relative ease. Every patient with Shoulder instability may not require surgery. Those patients who have a sedentary lifestyle and those who are not involved in strenuous activities or active sports may be able to manage without surgery as long as they are able to restrict activities which are likely to cause a dislocation or subluxation. However, there is an ever present risk of dislocation or symptomatic instability occurring at any point in time if the Shoulder is placed in a vulnerable position. Most young patients and those involved with any type of active sport are likely to need surgery to stabilize their Unstable Shoulder. This is performed through 3 small holes (called portals). 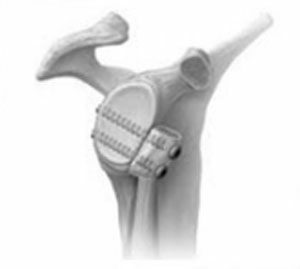 The Bankart Repair involves reattaching the detached labral-capsular complex to the glenoid using suture anchors. It is also possible to do a capsular shift (tightening of the lax capsule) at the same time. The advantage of the arthroscopic technique is its minimally invasive nature, which minimizes morbidity of surgery and hospital stay. In cases where there is significant bone loss in the glenoid or a large Hill Sachs Lesion (engaging Hill Sachs), a Bankart Repair alone is likely to fail. In such situations a Latarjet Procedure (transfer of coracoid process to the glenoid defect) or a bone graft to the Hill-Sachs Lesion needs to be performed. These procedures require an open operation. The patient may leave the hospital on the same day or the next day in case of an arthroscopic repair, and after 2-3 days after open surgery. The arm is placed in a shoulder immobilizer type of sling. The arm will be immobilized in the sling for a period of 3-6 weeks. At around 2-3 weeks after surgery, pendulum exercises (gravity assisted movements of the arm) are initiated. At around 4 weeks after surgery, full range-of-motion exercises are initiated. Strengthening of Shoulder Muscles are started at about 8 weeks after surgery. Overall it will take around 2 months after surgery for any patient to return to pre-operation status as far routine day-to-day activities are concerned. It may take around 3-4 months for a recreational athlete to return to sports, and even longer for a professional athlete (depending upon the nature of sport and the level of competition involved.